When Rabbi Simcha Katz arrived at the Orthodox Union’s New York offices on Monday, the first thing he did was turn on the lights. Newly installed as the organization’s 13th president, Teaneck resident Katz has plans to shine a light on what he sees as the two biggest threats to the Jewish community: Tuition costs and assimilation. 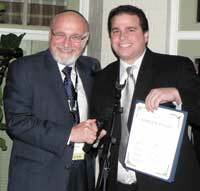 The father of Teaneck councilman and businessman Elie Katz, Simcha Katz was inaugurated as president on Sunday during the OU’s national convention in Woodcliff Lake. In September, Stephen Savitsky, then the OU’s president, asked Katz about assuming the organization’s leadership. Katz, a retired businessman who had spent the past five years as chair of the OU’s kashrut division and many more years working in the division with its CEO, Rabbi Menachem Genack of Englewood, was reluctant about making the time commitment. What convinced him, though, was hearing from one of his children who makes more than $200,000 a year about how difficult it is to manage day-school tuition bills. Assimilation is the second issue on Katz’s agenda, and one he called a “critical priority.” While the OU has had success in reaching out to unaffiliated high school students through NCSY, there are hundreds of thousands of Jews the organization is not reaching, Katz said. “We are losing Jews, whether it be on the high school level, when day-school kids go to college and get lost in the university melting pot…. It boils down to resources and organizing the community,” he said. The OU partners with Hillel: The Foundation for Jewish Campus Life to place Orthodox couples on college campuses for outreach to Orthodox students. The Jewish community tends to have a repetition of services, he said, and partnership is key to moving forward. It is a world leader in kashrut, he said, which is beyond denominations. The OU, he continued, is “a big tent” that is responsible to all Jews. Katz and his family moved to Teaneck in 1973 when Bnai Yeshurun was the only Orthodox synagogue in the township. He soon got involved with the Yeshiva of Hudson County, and spearheaded its transformation into the Yeshiva of North Jersey and its move to Bergen County. The school opened its first branch in New Milford in 1979, with nine children, and is now the Rosenbaum Yeshiva of North Jersey in River Edge with more than 900 pupils. He was also involved in the creation of Teaneck’s first mikvah and, because of his experience dealing with the township on the mikvah issue, he became one of the founders of Cong. Keter Torah on Roemer Avenue. In 1980, Genack became head of the OU’s kashrut division, and Rabbi Joseph Soloveitchik, Katz and Genack’s teacher and the man considered the father of modern Orthodoxy, asked Katz to help as a lay leader. In addition to rabbinic ordination, although he has never served as a rabbi, Katz has advanced degrees in engineering and business and he is a professor of finance at the Zicklin Business School of the City University of New York. Katz and his wife, Pesha, have four children and 16 grandchildren.